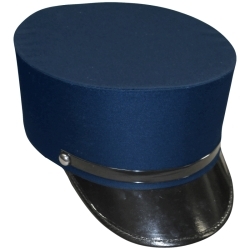 Navy train conductor hat with a polished black bill. This hat is perfect for train, railroad, or trolley conductors. Train conductor hat has a 3.5" crown, a 2" bill brim, and will fit a head size up to 23".